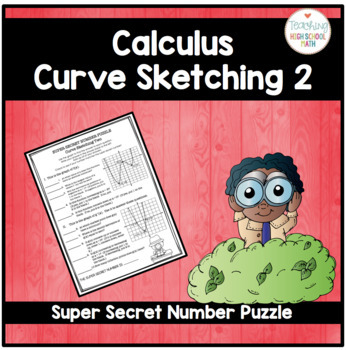 In this super secret number puzzle, students will practice finding important features of the original function, the first derivative of the function, and the second derivative of a function given a graph. Students need to know how to find where functions are increasing and decreasing, where functions have maximums and minimums, where functions are concave up and down, and where functions have inflection points. 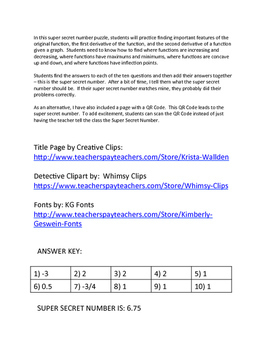 Students find the answers to each of the ten questions and then add their answers together – this is the super secret number. After a bit of time, I tell them what the super secret number should be. If their super secret number matches mine, they probably did their problems correctly. As an alternative, I have also included a page with a QR Code. This QR Code leads to the super secret number. 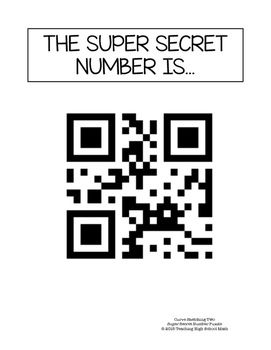 To add excitement, students can scan the QR Code instead of just having the teacher tell the class the Super Secret Number. Do you love Super Secret Number Puzzles? Here is a list of all of my other Calculus Puzzles.